Apple has launched a 2GB iPod Shuffle, and reduced the price of the 1GB version to $49. CUPERTINO, California¢â‚¬February 19, 2008¢â‚¬Apple today announced that its iPod shuffle, the worlds most wearable music player, is now even more affordably priced at $49 and that it is introducing a new 2GB model of the iPod shuffle for $69. The popular iPod shuffle is just half a cubic inch in volume, weighs just half an ounce, features an aluminum design with a built-in clip and comes in five colors¢â‚¬silver, blue, green, purple and a (PRODUCT) RED special edition. The iPod is the worlds most popular family of digital music players with over 140 million sold. The lineup includes iPod shuffle, the worlds most wearable iPod; iPod classic holding up to 40,000 songs*; the incredible iPod nano with video playback and the breakthrough iPod touch with a revolutionary Multi-Touch¢ž¢ user interface. iPod owners can choose from a vast ecosystem of accessories with over 4,000 products made specifically for the iPod including cases, fitness accessories, speaker systems and iPod connectivity in over 75 percent of US automobiles. The new 1GB iPod shuffle is available immediately for a suggested retail price of $49 (US) through the Apple Store (www.apple.com), Apples retail stores and Apple Authorized Resellers. 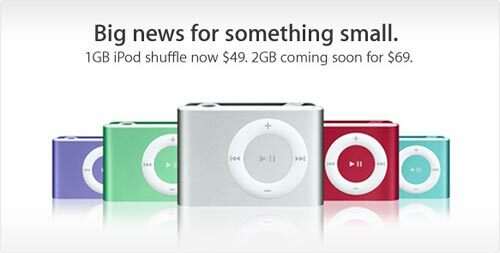 The 2GB iPod shuffle will be available later this month for a suggested retail price of $69 (US) through the Apple Store (www.apple.com), Apples retail stores and Apple Authorized Resellers. iPod shuffle requires a Mac with a USB 2.0 port, Mac OS X 10.4.8 or later and iTunes 7.4; or a Windows PC with a USB 2.0 port and Windows Vista or Windows XP Home or Professional (Service Pack 2) or later and iTunes 7.4 or later. So now you get the new 2GB model for $69 not bad and the 1GB version is reduced to $49.